Tá ceisteanna úra faoi ghníomhartha Airí an DUP i leith na Gaeilge agus iad i gcumhacht. Tá doiciméid tagtha chun solais a thaispeánann an oiread a chuir Arlene Foster agus a comhairleoir speisialta isteach ar easaontas polasaí faoi chomharthaí turasóireachta Gaeilge. Tá sé tagtha chun solais chomh maith nach ndearna an tAire Pobal atá ag dul as oifig, Paul Givan, aon mheasúnú comhionannais rialtais ar an chinneadh conspóideach deireadh a chur le scéim Ghaeilge, Líofa, i mí na Nollag. Roinnt seachtainí ina dhiaidh sin thug Paul Givan an £50,000 ar ais don scéim a cuireadh ar bun le cuidiú leo siúd atá faoi mhíbhuntaiste agus atá ag iarraidh an Ghaeilge a fhoghlaim sa Ghaeltacht. Dúirt sé nach raibh sé ag iarraidh go n-úsáidfeadh Sinn Féin an cinneadh mar “arm polaitiúil”, cé go bhfuil sé deimhnithe anois nach ndearna sé aon mheasúnú comhionannais ar an chinnneadh. Ag an am céanna, tá nasc bunaithe anois idir an tIar-Chéad-Aire Arlene Foster agus easaontas faoin Ghaeilge. Tá nasc déanta chomh maith lena hiar-chomhairleoir speisialta Andrew Crawford, a d’éirigh as a phost le déanaí mar gheall ar scannal na scéime fuinnimh inathnuaite (RHI). Léiritear go raibh inchur ag an bheirt ar iarratais ar chomharthaí turasóireachta Gaeilge ó dhá chomhairle áitiúla nuair a bhí Arlene Foster mar Aire ar an Roinn Fiontar, Trádála agus Infheistíochta (DETI). Mhol sí do Bhord Turasóireachta Thuaisceart Éireann (NITB) na comharthaí a dhiúltiú agus cloí leis an pholasaí Béarla amháin a úsáid. Is é an grúpa saoirsí sibhialta, ‘The Committee on the Administration of Justice’ (CAJ), a tháinig ar an eolas seo a fhad agus atá ceisteanna comhionannais lárnach sa ghéarchéim pholaitíochta ba chúis le titim Chomhthionól Stormont. D’eascair an t-achrann faoi chomharthaí dátheangacha ó phleananna Chomhairle an Dúin agus Chomhairle an Iúir agus Mhúrna comharthaí turasóireachta dátheangacha a chur in airde ar Chosán Oidhreachta Críostaíochta Naomh Pádraig. Sa bhliain 2010 rinne na comhairlí iarratais comharthaí i mBéarla agus i nGaeilge a chur in airde ar bhealach an tionscadail turasóireachta aitheanta seo. Bhí maoiniú le teacht ó Bhord Turasóireachta Thuaisceart Éireann (NITB) ag an am. Ina dhiaidh sin chuir NITB an fhéidearthacht do mhaoiniú ar son na gcomharthaí dátheangacha as an áireamh agus luaigh siad polasaí do chomharthaí ‘English only’, ach amháin dá mbeadh ainm Ghaeilge ar áit cheana agus aithne ar an ainm Gaeilge sin. Léiríonn doiciméid go ndearna Arlene Foster, a bhí mar Aire DETI ag an am agus freagrach as gnóthaí turasóireachta, teagmháil leis an NITB faoin achrann. Ag labhairt le The Detail, shéan an DUP go raibh conspóid ar bith leis an bhaint a bhí ag Arlene Foster leis, ag rá: "The signage in question was funded by the Northern Ireland Tourist Board and Arlene Foster, as the Minister, instructed that NITB policy should be adhered to." Dúshlán fada a bhí ag an CAJ agus iad ag lorg saoráil faisnéise. Tá léiriú úr ar an achrann teanga sna doiciméid faighte ag an CAJ. Mar chuid den chomhfhreagras idir oifigigh DETI agus an Bord Turasóireachta tá rphoist ón Aire Foster agus a comhairleoir speisialta Andrew Crawford. Ar an 23 Nollaig 2010, sheol Andrew Crawford rphost chuig Arlene Foster agus duine eile ach tá an t-ainm sin bainte den ríomhphost. Dúirt Andrew Crawford: “At Monday night’s meeting of Down council a long debate took place regarding signs for 14 locations on what is known as the St Patrick’s Trail. “These places are in North Down, Ards, Down and Newry and Mourne district council areas. “They are grant aided by the Tourism Board and NIEA [Northern Ireland Environmental Agency]. “While it was originally intended that all the signs would have the same design Down and Newry and Mourne have unilaterally decided to have these in Irish and English. “Can you check if we are funding Irish signs through the NITB? 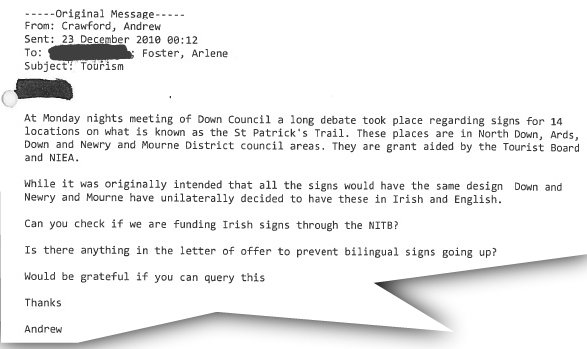 “Is there anything in the letter of offer to prevent bilingual signs going up? Coinníodh siar ainm an dara duine luaite leis an rphost agus mar sin ní léir ar seoladh chuig oifigeach ón Roinn nó chuig duine éigin in NITB nó áit éigin eile é.
Ach tá tagairt i litir ón Bhord Turasóireachta ina dhiaidh sin do “a request from Andrew Crawford in December 2010 about whether NITB was funding Irish signs”. 11 Eanáir 2011 atá luaite leis an chomhfhreagras a cuireadh chuig Príomhfheidhmeannach an Bhoird Turasóireachta, comhairleoir speisialta Foster; Andrew Crawford, an Rúnaí Buan, an Leas-Rúnaí agus oifigeach eile ó DETI. Sa cheangaltán leis an rphost bhí cuntas ar achrann na gcomhairlí agus chuir sé in iúl go raibh polasaí teanga NITB bunaithe ar chomhaontú maidir le húsáid teangacha ar chomharthaí bóthair. Dhá mhí ina dhiaidh sin, bhí aird an CAJ ar ais ar sheasamh polasaí NITB agus soiléiriú á chuardach acu ón Bhord Turasóireachta ar “basis, scope and lawfulness” an pholasaí a bhí beag nó mór neamhscríofa dar leis an eagras saoirsí sibhialta. Bhí comhfhreagras suntasach ag an Bhord Turasóireachta le DETI faoin achrann polasaí ar feadh bliana ansin tar éis cheisteanna an CAJ. Tá an comhfhreagras sin scaoilte amach anois agus taispeánann sé an bealach go raibh díospóireacht ag an Roinn leis an Bhord Turasóireachta faoi cé acu a bhí ina cheannródaí maidir leis an chinneadh polasaí. 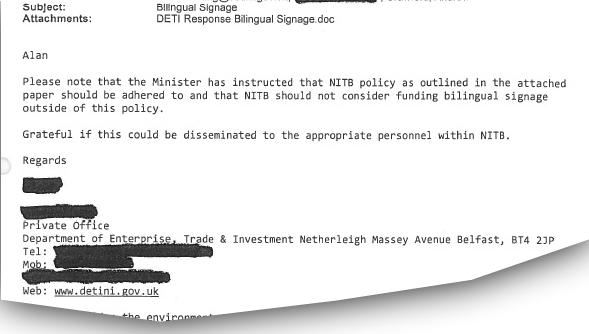 Deir litir ón NITB ó mhí Dheireadh Fómhair 2012: “NITB received a Departmental direction on this issue on 13th September as follows `The Department considers that NITB should respond along the lines of the approach outlined in point (i) - [Do not formalise a policy, but stand over the current approach. This could involve the inclusion of a Human Rights Impact Assessment proforma into the current Equality Screening procedures going forward;]. Dúirt litir na Roinne fosta go raibh an tAire Foster “simply stating that NITB should keep to its existing policy and not stray outside it” in Eanáir 2011. Tar éis ceisteanna ó The Detail, dúirt an Roinn Airgeadais arís nár tugadh aon treoracha ón Aire nó ón Roinn. D’éiligh an CAJ tuilleadh soiléirithe áfach. Sa bhliain 2014 chuir Coiste ón Chomhairle Eorpach de Shaineolaithe ar Chairt Eorpach na dTeangacha Reigiúnacha agus Mionteangacha a imní in iúl faoin seasamh polasaí i dTuaisceart Éireann ar chomharthaíocht dhátheangach. I dtuairisc ó Eanáir 2014 mhol Coiste ón Chomhairle Eorpach de Shaineolaithe ar an Chairt d’oifigigh i dTuaisceart Éireann “to provide concrete and detailed information regarding the reported decisions by the DRD (Department of Regional Development) Minister not to introduce bilingual signage, and the refusal of the Tourist Board to do so, which appear to be an infringement of the Charter”. Ó shin, tugadh polasaí úr isteach ar chomharthaíocht in áiseanna turasóireachta i mí Dheireadh Fómhair 2014. D’aontaigh Transport NI (Roads Service a bhí orthu roimhe sin), Tourism NI (NITB a bhí orthu roimhe sin) agus an DETI ar an pholasaí. Níl aon tagairt do sholáthar teanga sa pholasaí. Níor fhreagair Tourism NI sraith ceisteanna ar an cheist polasaí agus ar an soláthar teanga do chomharthaíocht turasóireachta. Ní raibh an Roinn Geilleagair, atá freagrach as turasóireacht, in ann an seasamh polasaí atá ann faoi láthair a shoiléiriú ach an oiread. Ar an 23 Márta 2015 chuir an Comhalta Tionól Reachtach ó Shinn Féin Caitríona Ruane Ceist Thionóil faoi tháillí an NITB a bhain le “challenges which were made against their decision to fund English only signage in the Downpatrick area”. Dhá lá roimh an Nollaig dheimhnigh an tAire Pobal ó DUP Paul Givan go raibh deireadh á chur aige leis an scéim deontais de £50,000 a thug an deis do dhaoine ó chúlraí faoi mhíbhuntaiste freastal ar ranganna samhraidh i nGaeltacht Dhún nan Gall. Cáineadh an cinneadh go láidir agus trí seachtaine ina dhiaidh sin bhí athrú iomlán ann do Scéim Líofa agus dúirt Paul Givan go raibh sé tar éis theacht ar “the necessary funding to advance the scheme”. D’fhogair an tAire Givan seo ar Twitter agus shéan sé níos moille gur chinneadh spreagtha ag an pholaitíocht a bhí sa chinneadh deireadh a chur le Líofa. Ach tá sé anois faighte amach ag The Detail nach ndearna an Roinn Pobal (DfC) measúnú ar na himpleachtaí a bheadh ag dúnadh an chiste ar chur chun cinn deiseanna cothroma i dTuaisceart Éireann. Dheimhnigh an Roinn Pobal an teip seo i litir chuig an CAJ agus an data 13 Eanáir 2017 luaite leis, seolta an lá tar éis do Paul Givan a chinneadh a athrú. 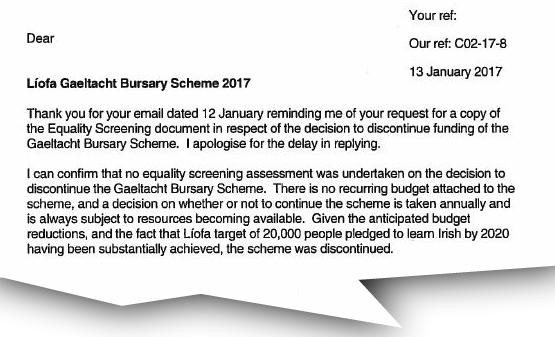 Deir sé fosta: “There is no recurring budget attached to the scheme, and a decision on whether or not to continue the scheme is taken annually and is always subject to resources becoming available. I ndoiciméad foilsithe ag an Roinn Pobal i mí Bhealtaine 2016 dúradh go ndéanfadh siad scagadh comhionannais chun measúnú a dhéanamh ar thionchar aon athruithe polasaí, ag tagairt d&apos;aon “strategy, policy initiative or practice and/or decision”. Dúirt urlabhraí ó Choimisún Comhionannais Thuaisceart Éireann go bhfuil dualgas reachtúil ar chomhlachtaí poiblí maidir leis “the need to promote equality of opportunity and regard the desirability of promoting good relations”. Dar leis an choimisiún is uirlis é an measúnú comhionannais do chomhlacht poiblí chun cinntiú go bhfuil siad ag comhlíonadh na ndualgas seo. Dhiúltaigh an DUP agus an Roinn Pobal aon rud a rá faoin eolas atá á thuairisciú anseo ag Meon Eile agus The Detail.